The BYD local sourcing question has been answered, albeit not in detail. The electric buses BYD www.byd.com will soon begin building in the city of Lancaster will have more than 70% local content, BYD SVP Stella Li told me during a press event at the company’s new Lancaster plant on May 1. “Close to 80% if the charger is included,” she said. And it can be. Well, the e6 has been relegated to the fleet heap, at least in the U.S. There were several of latest iteration of the electric crossover vehicle at the Lancaster event on May 1. But the model will only be used in fleets, several BYD folks told me. 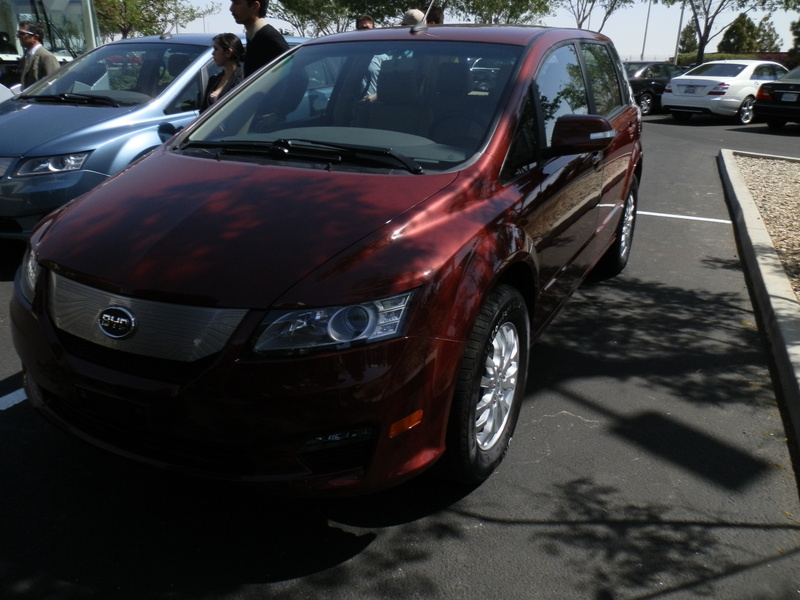 Several BYD e6 were at the Lancaster plant. They are slotted for taxi fleets. 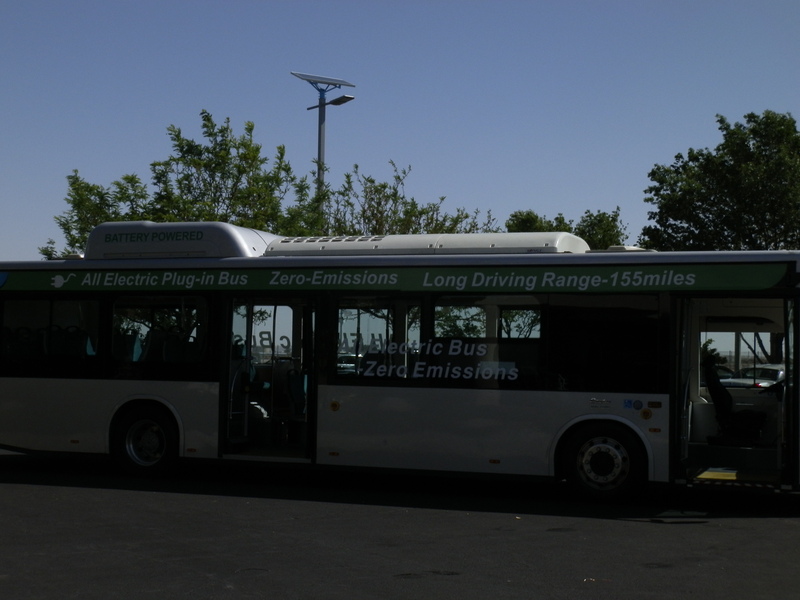 For now, BYD in the U.S. is all about buses. The Lancaster plant is the first to be opened in the U.S. by a Chinese automaker and the first bus plant for BYD in North or South America said Li. It has an annual capacity of more than 1,000 units. Production is due to begin in October of 2013, “if we keep to our aggressive schedule,” said Li. It aims to produce 50 units in the first year of operation. As for local content, the battery pack will be assembled in Lancaster, in a building a few miles from the bus plant. The cells will be imported from China. That will likely account for a big chunk of local content. Other local content includes the multiplex electronic controls, which will be supplied by I/O Controls www.iocontrols.com in Azusa, CA, said Michael Kuang, regional vice president of engineering for Azusa. He was at the event. There are plenty of other things that are easy to source domestically, such as seating and lighting, he suggested. True that. And, BYD can count the two inductive chargers that will be supplied by WAVE http://www.waveipt.com/ , a Utah-based start-up, as local content as well, says John Inglish, a board member at WAVE. He was also at the event. As noted up top, there were several e6 BEVs parked at the event. But Li said BYD is focused on taxi fleets for the e6 sales. She also said, however, that BYD wants to sell cars to consumers in the U.S. in the next several years. Assume she means electric vehicles, though I guess she could mean gasoline-powered cars. In any case, Li said that if there was sufficient demand BYD might localize car production in the U.S. within 10 years. That includes the fleet vehicles, I ‘m guessing. One thing I know: The City of Lancaster is pretty psyched to have BYD come to town. All the city officials showed up for the plant opening, as did an assortment of state and county officials. Lancaster is part of Los Angeles County. Inexplicably, there were at least a dozen LA County Sheriffs at the event. Lancaster contracts with the Sheriffs to provide its police force, but surely they didn’t all need to turn out for the peaceful event…. I asked Los Angeles County Supervisor Mike Antonovich if he expected any blowback because BYD is a Chinese company. There has been some noise in the press about Long Beach Transit awarding BYD the 10-bus contract over several U.S. companies. Sounds like the big e6 plans are now on the back burner. But I can’t help wonder how those other BYD products are doing in California. That is, the 10 F3DMs, that were leased to the LA Housing Authority a few years ago. Haven’t heard anything negative about them, and so have wondered how they are performing, and whether they will be replaced with the F3DM successor. The so-called Qin is it? I will call the LA Housing Authority and see if they are still using the F3DM. Or ask BYD…. But, that model has been discontinued. BYD will likely introduce the next-gen DM model, which is the Qin, here in the U.S, sources tell me. Not sure when. Will ask if they will also be given to fleets. The F6 is destined for taxi fleets for now. Not sure if that means here in the U.S. or just in China. @Laurence. I asked BYD about the F3DM: Michael Austin replied: The two year pilot ended last year and the cars went back to BYD. We have not offered them a QIN yet, but that is a great car for them when we are ready. And you are right about the Qin. It should be a good performer, with its 50km range in E-mode, and its 0-100kph in 6.9 seconds.